You would be hard-pressed to find a sailor without other outdoor passions such as skiing, cycling, running, kayaking, waterskiing, rafting, camping, or hiking. The outdoorsy types who are attracted to the sport don’t mind the sun, rain, and wind (and more wind). Dressing for success in sailing has nothing to do with fashionable navy-blue striped sweaters—especially if they’re all cotton. The key to dressing well in sailing, as in other outdoor sports, is learning how to remain comfortable, dry, and mobile in the face of the elements. Before you go out and make any investment in new gear, check your closet and assess what you already have to cover you from head to toe. If you already ride your bike on mountain trails, run around the neighborhood, hike in the woods, or hit the slopes from time to time, you may already have the gear necessary to get started. We’re not suggesting you don’t invest in sailing-specific gear; we’re saying that the lack of it should not be a barrier to entry. You might have enough makeshift gear to start right now. Then once you’re hooked on sailing—as we know you will be—you will learn quickly what you need to complete your sailing gear kit. Like runners, many sailors like to have a visor to protect their eyes and face from sun and rain. A safe bet is an old-fashioned baseball cap. A hat strap with a collar clip is helpful, as more “man overboard” drills are done for runaway hats than for men. Nothing says “newbie” quite like a bad sunburn. Sunblock is a must, even when it’s cloudy. Skiers, snowboarders, waterskiers, and paddlers know that snow and water reflection make the sun twice as powerful. Effective, non-greasy, high-protection sunblock is available at ordinary drug stores. Many sailors wear SPF clothing, which is available at outdoor stores and marine gear stores (also known as chandleries). As in any outdoor sport performed in temperatures between 50 and 100 degrees, high-tech layers are the answer. A T-shirt, long-sleeved shirt, fleece vest, fleece pull-over, and nylon shorts/pants such as used for hiking and camping would almost complete your sailing gear needs. The outer layer or foul weather gear for sailing isn’t unlike hiking outerwear, except that the retro cheapie poncho, which might be useful on a rainy hike, would be a nuisance in the wind. Make sure you find waterproof outer tops and bottoms that will not flap in the wind, and always assume it will rain. Rain usually brings wind, and wind is a good thing—a wet rear end is not. A cold and soggy behind could ruin an otherwise terrific sailing day. You may already have a functional Gore-Tex shell, but do find yourself some waterproof bottoms as well. You can buy reasonable, effective foul weather gear for $250 (or more) new. If you find a crew to sail with, it’s a guarantee they’ll each have some surplus gear to lend or donate. When it comes to lifejackets, your crew will have one onboard for you, but you might want to invest in a more stylish one; lightweight and attractive lifejackets really do exist! The vest styles can be great for keeping you warm and safe. Sailing gloves are reasonably priced ($20) and an excellent investment for new sailors. Cycling gloves work, too. Slipping on a wet deck, stubbing your toe on metal hardware, and scuffing up the deck of someone else’s boat are the considerations when you choose sailing footwear. 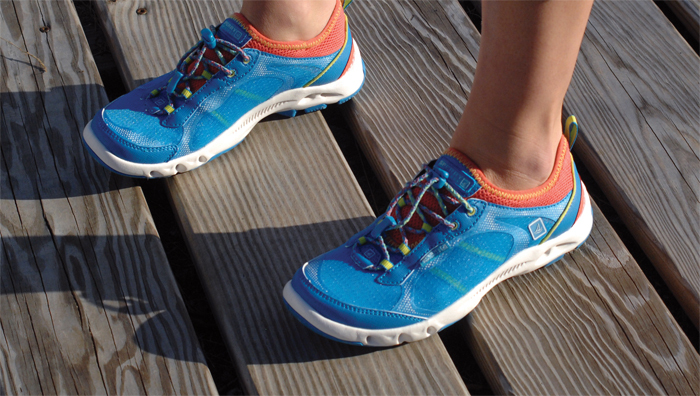 Flip-flops and dark-soled running or hiking shoes make lousy sailing shoes. Chuck Taylor high tops, white-soled tennis shoes, Keens, Tevas, and old-fashioned Top-Siders or Sperrys make good non-scuffing sailing shoes. High-tech wicking socks are the best.